The Biggest Formed Families Resource Directory Yet! A Back-to-School gift for all formed families! 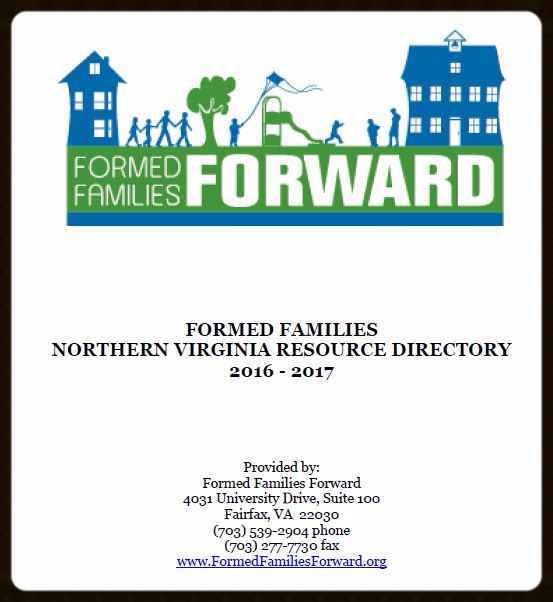 Our biggest and best yet Formed Families Northern Virginia Resource Directory for 2016-17 is HERE! A favorite of families and professionals alike, our Resource Directory lists hundreds of organizations, agencies, providers and other resources available to support foster, adoptive and kinship families raising children and youth with special needs. Each listing offers hotlinked contact information and a description of the services and supports offered. A HUGE thank you to Anne Havlovick for reorganizing and updating the Directory this summer. We work to provide the most current contact information and it's a big job to make it all presentable! Let us know if you find errors or have suggestions for additional entries. Due to the large size of the document, downloading is encouraged. Bound hard copies can be purchased at cost. Q & A: Should my Teen Attend a Support Group? Q: The counselor at school suggested my daughter (who is adopted) attend a peer support group. Is that a good idea? I am afraid she might meet other kids with even bigger issues. Where would I even find a group for her? A: Great questions and thank you for proceeding carefully! YouthMOVE National offers information about youth peer supports, delivered one-on-one and in other formats. In our region, there are a number of options for finding a peer support group that is the perfect fit for your child. NAMI (National Alliance on Mental Illness) of No Va offers a variety of free peer support groups and classes for young adults, and for parents, caregivers and family members. CHADD of No Va hosts several support groups for youth and adults with ADHD. The Center for Adoption Support and Education (CASE) periodically offers support groups for children and youth who are adopted. Our new edition of the Formed Families No Va Resource Directory includes many private providers that offer social skills groups, and other types of peer supports. Community Services Boards also often offer groups. 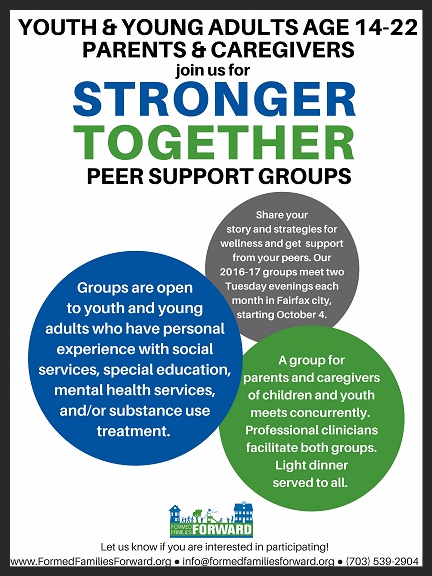 Our Formed Families Forward Stronger Together peer support groups for youth and young adults ages 14-22, and for parents and caregivers start in October. The facilitated groups meet two Tuesday evenings a month and dinner is provided! Many free and low-cost training events are available to parents, caregivers and professionals this autumn. Check out these offerings from FFF and friends! September 10- Worldwide Suicide Prevention Day; National Suicide Prevention week is September 5 - 11. Ideas for Action. September 12- Adoptive, Foster Book Club, sponsored by Fairfax County Foster Care and Adoption Association, Alexandria. September 16-17- PEATC's Parents and Youth Exhibiting Strength Summit, Williamsburg. FFF Board member Amy Fortney Parks is a Keynote presenter! September 22- Executive Dysfunction and Helping your Child Succeed in School webinar, hosted by CASE. September 22- Arlington County Special Education PTA meeting, workshop Is your Child the Target of Bullying? by PEATC, Arlington. September 28- Adopting When You Are Already Parenting webinar from Adoptive Families magazine. The Fairfax County Children's Services Act (CSA) office is seeking nominations of parents and caregivers who have experience with behavioral and mental health services for their children and youth. Parent and caregiver representatives serve on two important groups- the Community Policy and Management Team, and Family Assessment and Planning Teams (FAPTs). A small stipend is available to those who serve. Your parent voice is critical to improving both systems and services for individual families. Learn more HERE. The entire list of featured apps can be found HERE. Facebook Fans - LIKE us, you'll love us! Miss our posts on kinship care support, going back to school with FASD, or special needs trusts? We share fabulous information finds every day on Facebook. LIKE us on Facebook and get great information just for formed families and professionals who care about adoption, foster care and kinship care.